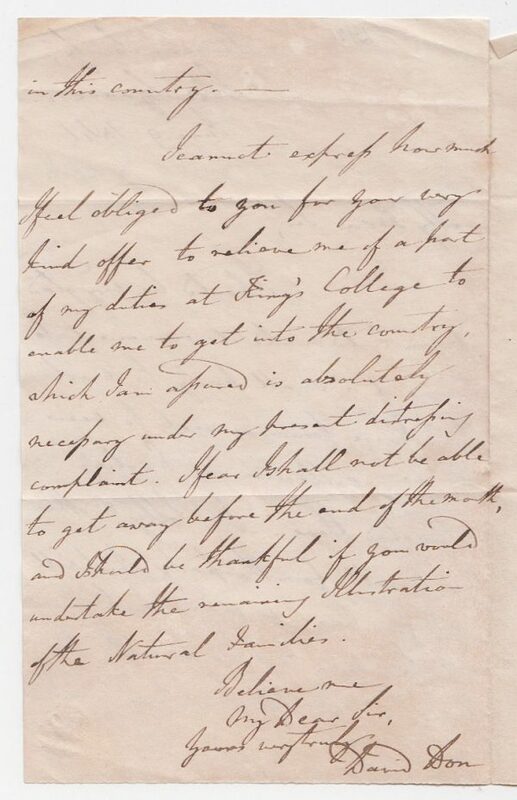 Autograph Letter Signed, to John Forbes Royle, inviting him to be one of a party “to visit Syon House tomorrow week to view the fine collection of Exotics cultivated there”, thanking Royle for relieving Don of some of his duties at King’s College. 2 pp. 7 x 4 inches, light staining to first page, integral blank leaf (partly separated). Linnean Society, Soho Square, 9 June 1841. “I should be thankful of you would undertake the remaining Illustration of the Natural Families.” David Don (1800-41), botanist, librarian of the Linnean Society, professor of botany at King’s College, London. His chief independent work was Prodromus Florae Nepalensis (1825).